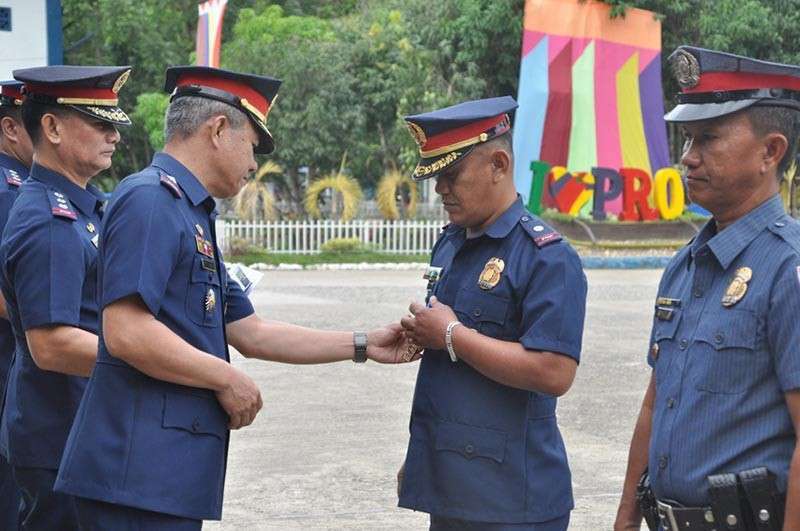 THIRTEEN policemen, including three officers of the Police Regional Office (PRO)-Zamboanga Peninsula were awarded medal for their accomplishments in the campaign against illegal drugs and for the peaceful conduct of the plebiscite last January 21 on the Bangsamoro Organic Law (BOL). The awardee-policemen for successful anti-drug operation are: Chief Inspector Elmer Solon, Police Station 11 chief, and two of his personnel, PO3 Yusop Ismael and PO3 Chandee Piccio. They were cited for the January 4, 2019 arrest of three drug personalities identified as Ismael Nassal, Sadan Jailani, and Rajan Jumaani that resulted to the confiscation of some P6.9 million suspected in Zamboanga City. Chief Superintendent Edwin De Ocampo, deputy regional director for administration (DRDA), who led the awarding of medal, said the three suspects were arrested in a drug bust in an eatery at Pilar Street in Zone 4 village, this city. The awarding of medal was held after the flag-raising ceremony on Monday, February 11, in Camp Abendan that houses the PRO-Zamboanga Peninsula headquarters in the village of Mercedes, this city. The other awardee-policemen for successful anti-drug operation are: Chief Inspector Gaspar Gadingan, SPO1 Bensar Elhano, PO2 Jay Jose and PO2 Alexander Delos Reyes, all from the Drugs Enforcement Unit of the Police Station 11 under the Zamboanga City Police Office (ZCPO). They were cited for the arrest of drug suspect identified as Al-Caff Jikiril during a buy-bust operation on December 11, 2018 at R.T. Lim Boulevard in the village of San Jose-Cawa-Cawa, this city. The team recovered from Jikiril 51 grams of suspected shabu with market value of P346, 800, one unit “Bonggo” and marked money. The awardees for the peaceful conduct of the BOL plebiscite on January 21 are: Superintendent William Gadayan, Isabela City Police chief; Senior Inspector Benjemar Ajibon and PO3 Arvin Jamaluddin, also from Isabela City; Senior Inspector Richmond Candido, PO3 Gajer Halkin and PO1 Jerham Anig, all from the Regional Mobile Force Battalion-9. They were cited for the commendable accomplishment rendered in providing security coverage which resulted in a peaceful plebiscite on the BOL in Isabela City, Basilan and Bongao, Tawi-Tawi on January 21. The awardee-policemen cited for the peaceful conduct of the BOL plebiscite received the Medalya ng Papuri (PNP Commendation Medal).